Sometimes you just know. You see a recipe and you don’t even have to think about it or wonder how it will taste or worry about the technique because you know it will be great. You can already imagine the flavor, and it’s very, very good. That was what happened when I saw this dessert in July’s Food and Wine. 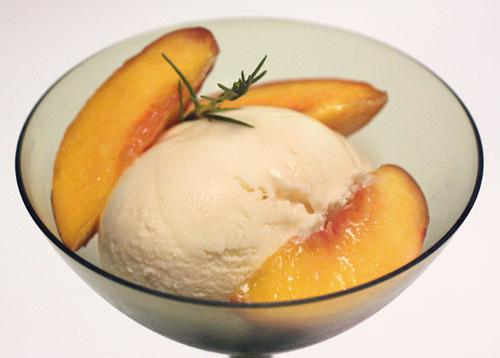 Yes, ice cream made with mascarpone and served with peaches floating in a white wine-honey syrup scented with rosemary required no thinking. This was also a good choice for dessert because local peaches are still available, and rosemary is one of the few items in my yard that hasn’t succumbed to the searing, persistent heat this summer. The garlic chives are limply hanging on, the lemongrass is ok but requires a lot of water, and there are still a few green leaves on the sage. The basil isn’t entirely happy, but it’s surviving in containers which are watered daily. Everything else is long dead, but the rosemary doesn’t mind this weather at all, and I was happy to find another use for it. The ice cream was made with a pretty standard custard including four egg yolks and whole milk. After the custard was cooked and poured into a bowl to cool, mascarpone was whisked into it, and then it was churned in an ice cream maker. For the syrup, white wine, honey, water, and sugar were combined in a saucepan and boiled until reduced by half. Rosemary was added and allowed to steep, and I veered from the recipe at this point. 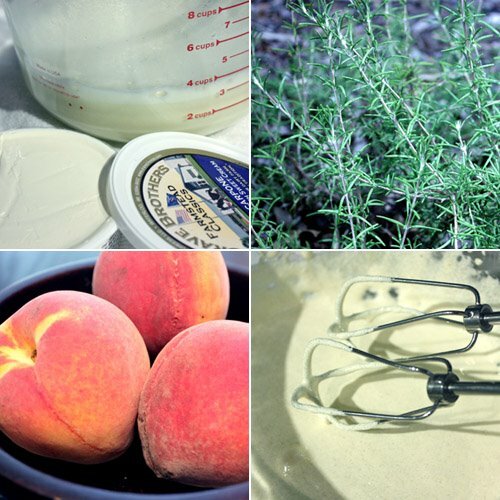 Rather than pouring the syrup over peaches and baking them, I simply sliced the peaches and let them sit in the warm syrup while it steeped with the rosemary. I wanted to keep the peaches a little firmer and closer to their fresh state. They were so fragrant and juicy, I didn’t feel the need to bake them to intensify the flavor. A big scoop of the ice cream was topped with peach slices and a few spoons of syrup. The interesting thing about the ice cream is that there is no vanilla. The flavor comes entirely from the mascarpone. It was a nice change from the familiar taste of vanilla, and it was as good as expected with the peaches and syrup. OH WOW. I have to make this immediately. I'm a on big ice cream kick these days--just made burnt sugar ice cream this weekend. This is divine and heavenly. you are so right - I know exactly what this would taste like - I am smacking my lips for some mascarpone right now - the rosemary steeped peaches sound great! Sounds fabulous! And I just placed an order for a 25 lb. box of Colorado peaches. You're definitely getting some good mileage with the ice cream maker. This sounds simple and so good! I haven't tried this yet, but I KNOW I'll fall dangerously in love with this ice cream. I'll bet it isn't as sweet as the other kind, just the way I like it! Mascarpone ice cream?!?! I'm drooling, it sounds delicious and oh so perfect with peaches! You said t, sometimes you just know. I know! It looks stupendous! I can almost taste how delicious this mascarpone ice cream would be! Sounds excellent paired with peaches! That ice cream must be heavenly! I REALLY want an ice cream maker. It's definitely a perfect match with the peaches. I can just imagine a bowl of that in front of me right now. Sometimes I wish those Star Trek food replicators actually exist. This looks so creamy and delicious..
Wow, such a creamy ice cream, I wanna try it too. Love with peaches as well! Lovely pic! ooo yes, I can imagine how good this taste! Great flavours! i recently tried some cream cheese ice cream, and while it was pretty darn tasty, i think this would be better--those peaches and that syrup would be the perfect foils! The ice cream sounds yummy. I love how rosemary is so easily adaptable to both sweet and savory dishes. Herb in sweet dishes always take it up a notch. Beautiful. Fantastic!! 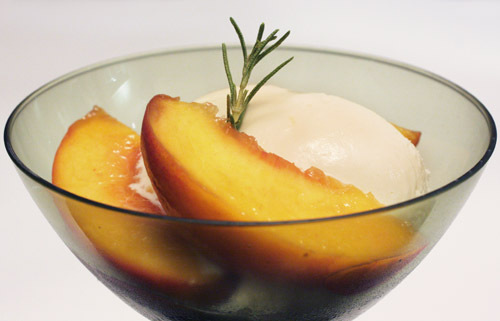 Mascarpone cheese & peaches & Ice cream, can anything get better than this!! A big WOW lisa. This has to be one of my favorite desserts. You make it look so easy and gorgeous. Never thought marscarpone would carry a flavor strong enough for ice cream. So interesting. I saw it too and thought about making it. Now I will. Whoa! That looks absolutely excellent!!! Looks excellent and so refreshing. Peaches on the top are great idea! Can I come over right now for a big bowl of that? I LOVE anything with mascarpone, and peaches are my fave fruit. This is dessert heaven that you have created here. Our rosemary bushes died in the great snow storm of 2008, but fortunately, we planted some more that are thriving in our hot summer. It's a good thing too because I can't wait to make this. So awesome and gorgeous pics! Oh my I really have to start making any frozen dessert. This looks awesome. Goodness, this ice cream sounds really tempting. OH yum, this looks delicious, good eye for finding this one! I agree with your other comments - this looks heavenly delicious. What a nice combo of flavors. yumm!!! i vud love to try this for this weekend.. vat a perfect combo :) sound delicious!! I know what they say about the egg but I believe the peach is the perfect food, especially right about now. Rosemary is pretty awesome too, particularly since, as you point out, it can hang on in the worst drought and heat. I love pairing savory with sweet and lush -- great combo here!